A hybrid threat is the diverse and dynamic combination of regular forces, irregular forces, and/or criminal elements all unified to achieve mutually benefiting effects. This introduction and the first two chapters will focus on the nature of hybrid threats that U.S. forces can expect to face in various operational environ-ments. However, the remainder of this TC will focus on the representation of such hybrid threats in training exercises. In that context, the force that constitutes the enemy, adversary, or threat for an exercise is called the Hybrid Threat, with the acronym HT. Whenever the acronym is used, readers should understand that as refer-ring to the Hybrid Threat, which is a realistic and representative composite of actual hybrid threats. 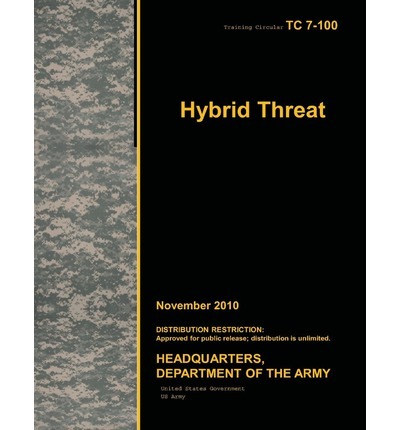 The purpose of this training circular (TC 7-100) is to describe hybrid threats and summarize the manner in which such future threats may operationally organize to fight U.S. forces. It also outlines the strategy, operations, tactics, and organization of the Hybrid Threat that represents a composite of actual threat forces as an opposing force (OPFOR) for training exercises. This publication applies to the Active Army, the Army National Guard (ARNG)/Army National Guard of the United States (ARNGUS), and the United States Army Reserve (USAR) unless otherwise stated. Headquarters, U.S. Army Training and Doctrine Command (TRADOC) is the proponent for this TC. The pre-paring agency is the Contemporary Operational Environment and Threat Integration Directorate (CTID), TRADOC G-2 Intelligence Support Activity (TRISA)-Threats. This TC will address an emerging category of threats and activities that do not fit into the traditional understanding of conventional and unconventional war. It will focus on hybrid threats as simultaneous combinations of various types of activities by ene-mies and adversaries that will change and adapt over time. This TC summarizes the manner in which future threats operationally organize to fight us. However, it also discusses the strategy, operations, tactics, and organizations of the Hybrid Threat (HT), which portrays such forces in training exercises. For more detailed discussions of HT operations, tactics, and organizations, the reader should consult other TCs in the 7-100 series and supporting products."